See my publisher's websites: www.tundrabooks.com and www.tradewindbooks.com. November 2016, published by Tradewind Books. Illustrated by Kathryn E. Shoemaker sequel to the Graphic novel, GOOD- BYE MARIANNE, Tundra books. 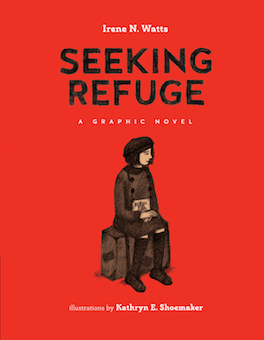 SEEKING REFUGE is loosely based on the play Remember Me, Playwrights Guild of Canada and the novel of the same name, Tundra books. Western Canadian Jewish Berkowitz Award for children and Youth, 2018. It is December, 2, 1938, the first Kindertransport arrives in England from Berlin. On board the Rescue train are over two hundred children at risk from the Nazis. Eleven year old Marianne Kohn is amongst them. It is twenty four hours since she said good-bye to her mother, she does not know if she will ever see her again. Her snobbish English foster mother, is unsympathetic to the young foreigner. World War 2 breaks out in September, 1939, and Marianne is evacuated to South Wales. She must cope with new problems both in and out of school. However her hope and resilience is finally rewarded. Then as today the refugee experience takes its toll on those who flee their homes because of persecution. Awarded the 2017, VINE Award presented by the Koffler Centre, Toronto, Ontario, For Jewish literature for Children and Young Adults. The Award is given by Glowinsky Family Foundation. “What a collaboration in this lovely and important book! The illustrations suit the dark story so well. It’s the details of Marianne’s journey that bring it to life for me. Not having her own name, the way she is shifted around with people speaking to her in English and then in Welsh, the longing for her mother, all very poignant and real.” From Beryl Young, author of: CHARLIE, A Home Child’s Life in Canada, Key Porter Books. September 2013, published by Tundra Books. A young Russian, Jewish girl, joins her immigrant father in New York. She finds work at the Triangle Waist Company. 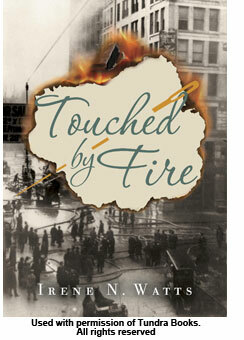 In 1911, she and hundreds of other garment workers are caught in a deadly fire that engulfs the factory. November 2013, published by Tundra Books. December 2013 marks the 75th Anniversary of the Kindertransport. This omnibus edition contains all three books of the ‘Marianne Stories. 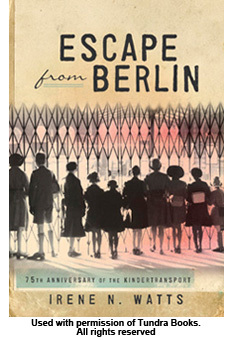 “ Many books have been written about the Kindertransport but none have related as complete a history of the experience as has this publication that combines the three novels in one volume.... 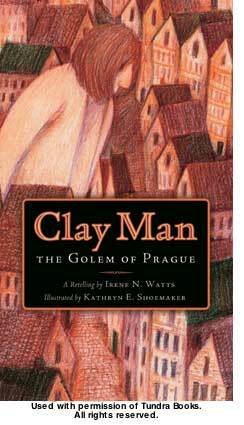 This book will be very sought after.” Starred review by Monica Weiss Posner, Jewish Book Council. Fourteen year old Louisa Garderner works as a nursemaid to young daughters of a titled family in London. Despite being bullied by stern Nanny Mackintocsh she is happy in her work. However Louisa is haunted by the memory of her toddler brother’s death, when she was five. She blames herself for his accidental drowning on a trip to the sea-side. Her fears come to pass when she is told that the family will be traveling on the Titanic on her maiden voyage to New York, in 1912. If she refuses to go, she will lose her employment and her chance of a better life. She makes her decision and must finally face her greatest fears on the voyage that changes lives forever. No Moon is featured in VOYA Magazine’s top shelf for Middle School Readers 2010 list. It is selected by a committee of professional librarians and teachers who share the titles with middle school students. February 2011. Nina, Grade 8 said: this historical fiction book was really descriptive and interesting. Illustrated by Kathryn E. Shoemaker, Tradewind Books, October 2010. Ages 7-9. When Matthew moves from the country to Vancouver with his single mom, he has to leave his dog, Lucky, behind. Why? The sign on his building says: NO PETS ALLOWED. Matthew creates an invisible puppy, Fred. Together, Matthew and Fred search for a solution to reunite with Lucky. This is an easy- to- read novel, perfect for students transitioning into reading chapter books. Each of the eleven chapters contain delightful illustrations by artist Kathryn Shoemaker… they include Matthew’s imaginary dog, Fred, thus immersing the readers into Matthew’s world. 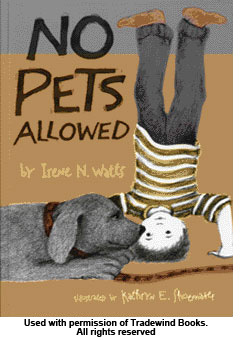 No Pets Allowed touches on many themes for young readers-moving, adjusting to life changes, making new friends and loneliness. The relationships are highly believable and readable. The novel would be an asset for any home, elementary school, or public library. CM Volume 117. Number 21 www.umanitoba.ca Reviewed by, Dr. Kristen Ferguson, who teaches Language Arts at the Schulich School of Education at Nipissing University in North Bay, ON. 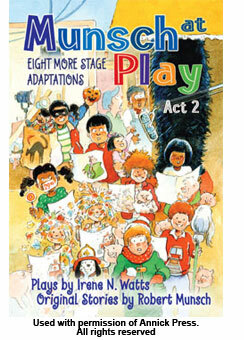 The plays which include The Paper Bag Princess and Stephanie’s Ponytail have been adapted for stage, classroom or backyard and include suggestions for presentation, casting, props and costumes. 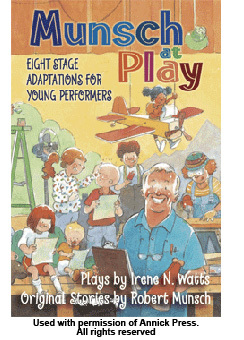 MUNSCH AT PLAY has been selected as a starred selection in The Canadian Book Centre’s Best Books for Kids and Teens for 2011. “I’m dreaming of the right kid’s book” Selected by Susan Perren, the Globe & Mail for holiday reading. The place is Berlin, Germany, 1938, Hitler rules the country. It is a cold November, one week after the Night of the Broken Glass. 11 year old Marianne Kohn is expelled from school, her father is on the run from the Nazis and her mother fears for her daughter’s safety. The story of how ten thousand children at risk were saved by the Kindertransport. “The particular appeal of Marianne’s story is that of the ordinary woes of childhood- loneliness, boredom, betrayal of a friend- are in the foreground. In its graphic novel incarnation, the story retains this familiarity and welcomes a new crop of readers. Shoemaker’s style is gentle, shaded and soft edged, she filters the horror thus allowing some access to this world to quite young children.” Review by Sarah Ellis, QUILL & QUIRE, August, 2008. When her mother dies three days after Eddie is born, 12 year old Millie must take care of her father and young brothers. Who is the strange woman who appears in the small Ontario town? Why is she so interested in the baby? Will Millie manage to keep her promise to her Mother to hold the family together? “Watts’ keen eye for period detail, her vivid characterization and her estimable heroine make this novel a very affecting one.” Review, Susan Perren, The Globe and Mail. 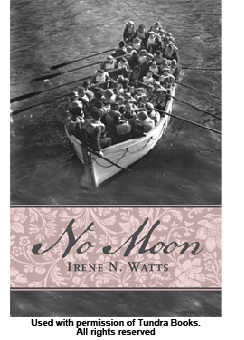 Twelve year old orphans, William and Lillie meet onboard ship bound for Canada and the promise of a better life. They, and many of the 100,000 Home children shipped from Britain between 1867 to 1967 endured unimaginable hardships. What is their connection to Katie, living with her own problems in the present day? ‘Welcome Rain’, the Korean Publishers, will translate Flower into Korean. This is the first foreign title in their children’s list. “Flower is a journey of hope and a mystery… The characters are finely drawn, the story is irresistible…” Review from Marion Farrant, the Vancouver Sun. * LILLIE, a play based on William and Lillie’s story from FLOWER, won first Prize at the International Playwrights Forum, UNESCO, 2006, and premiered in Athens, Greece, March 2007. Excerpts by Canadian writers include: Leonard Cohen, Claudia Cornwall, Kathy Kacer, Karen Levine, Jean Little, Carol Matas, Lillian Boraks- Nemetz, Mordecai Richler, Jason Sherman, Ellen Schwartz, Irene Watts, Eva Wiseman. Survivor statements introduce each section which reflects on Hiding, Selection, Ghetto, Exile and Resistance. Maps, a Time line and further reading are included. “A major addition to Shoah literature…It is heartwarming, inspiring and memorable.” Review Donna Silverman, Ottowa Jewish Bulletin. The final book in the Trilogy about the Kindertransport reunites Marianne and Sophie, separated since their arrival in Britain. Set in the aftermath of the Second World War 1945, the children of the Kindertransport find out what happened to their families during six years of war. Sophie must adjust to who she is and where she belongs. The companion book to Good-bye Marianne; eleven year old Marianne Kohn has left Germany and arrived in England, one of ten thousand children who managed to escape Hitler. She knows no one, does not speak English and is homesick for her parents, not knowing when she will see them again. The outbreak of war leaves her even more alone. Marianne’s world is collapsing. Like other Jewish students she is expelled from school, her father is on the run from the Gestapo, and she and her family are rejected by friends and neighbours. When the Gestapo invade their home, Marianne’s mother realizes she can no longer keep her daughter safe. They must make a heartbreaking decision. The story of Purim told in three time frames: present day, ancient times and 1938. A Grandmother tells her granddaughter about hearing the Purim story as a child, in nazi occupied Vienna. The rabbi is interrupted in his retelling of Queen Esther by a group of soldiers arriving to arrest him. They remain, held spellbound by the story; miraculously they allow the rabbi and the children to leave in safety. “The three narratives with that of Esther at the centre are woven into one tale of courage and of hope. 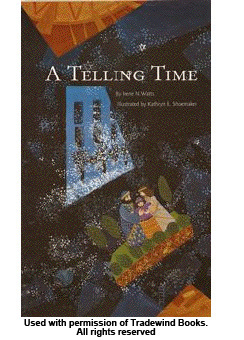 The illustrations are outstanding in conveying mood and setting…jewel tones resembling tapestries used to tell the tale of Queen Esther.” Linda R. Silver, review Spring Issue Jewish Book World. * Awarded A White Raven, Bologna 2006 by the international Jugend Bibliothek Munich. Selected scenes and monologues have been anthologized in, 'Rattling the Stage' McGraw-Hill, Ryerson, 'She Speaks', Monologues for Women, edited by Judith Thompson, PCP, and 'Two for the Show', Scenes for Student Actors, edited by Brian Kennedy, PCP.